All is not lost just because you don’t have a driver’s license or a car. If you feel the need for speed but don’t have the means to fulfill it, you could always try learning how to build a go cart. Just remember that these vehicles are not suitable to actual road driving! You will definitely need to have a welder to build this project. Equipment such as this can be hired, but you should also learn to weld properly, making good quality welds with uniform beads and proper penetration. The plans of your go cart notwithstanding, the size of the vehicle will vary with that of the driver. Kid-sized drivers usually need a frame 50 inches long and 30 inches wide while an adult-sized frame should be about 72 inches long and 40 inches wide. 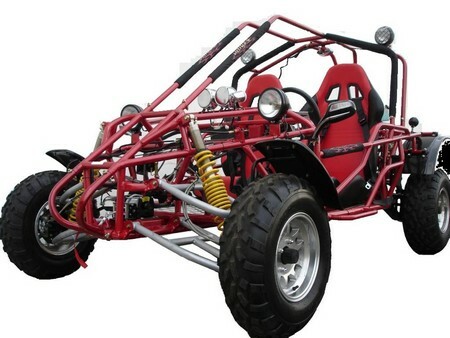 Parts for your go cart can be salvaged from a discarded riding lawnmower or even a junked go cart. Scour yard sales and junk yards until you’ve found all the necessary parts. The metal tubing has to be cut out based on your blueprints before the pieces are welded together. Adding gussets at corners will help provide more strength to the structure. The steering linkage is to be assembled next with 0.5-inch wide steel rod for the linkages and 0.75-inch wide steel rod for the axles. A torch hat may be needed to heat the 0.75-inch rods so that they can be bent at right angles. This is not a job that can be rushed if you want to have satisfactory results. The axle is built with a straight piece of 0.75-inch steel rod and attached to the frame with 2 bushings. The arrangement is kept in position by using washers and drilling cotter pins through the axle. The drive pulley is attached on the axle just before the axle is mounted on the bushings. A set screw can be used to hold it in place, or it can be directly welded to the axle. Remember to align the drive pulley with the engine pulley in order to know how to build a go cart properly. The engine is mounted via a flat, 0.19-inch steel plate welded to the rear of the frame. The engine is first placed on the plate so that the holes for the mounting bolts can be marked and the engine and drive pulleys line up on the axle. 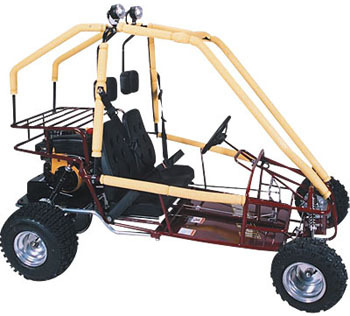 The seat and floor boards of the go cart can be built from plywood lumber or even metal. As this is a small vehicle only to be used for recreation, you shouldn’t use a large engine or high gear ratio for it, and always remember to wear protective gear when driving one.